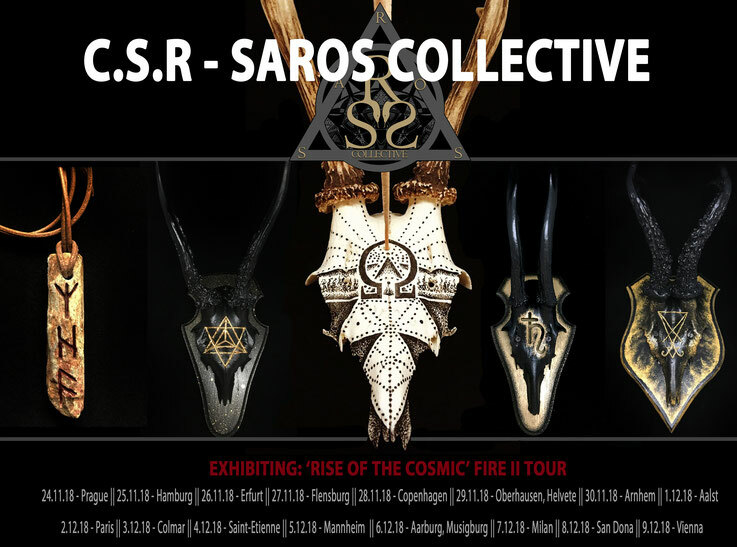 C.S.R - SAROS COLLECTIVE - Realizing specific conceptual tour productions. I’ve been passionate about pencil drawing during childhood until late teen years, and was then studying at an art school for 2 years, before completely turning my back on visual art for the sake of music during my early 20s. 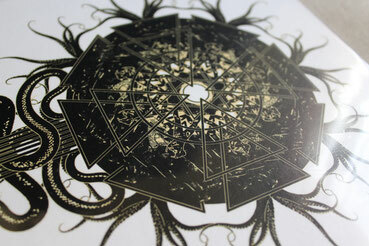 Over the years as a musician I was confronted with visual arts a lot again though, so I finally got drawn back into them, taking care of layout issues and later on merch & artwork design. 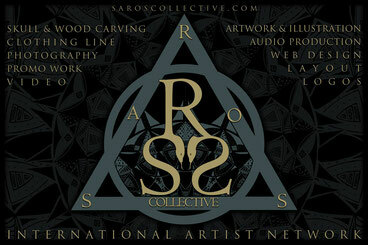 At some point a fellow musician asked me to do a logo for him, that’s basically how I started doing design for other people, not long after, under the SAROS Collective banner. Around the same time I started the skull carving as well, which was an idea that suddenly hit me a while ago, can’t really tell why. I started off with a skull I got from one of my former art teachers, completely from scratch without having any clue what to do. It turned out very well, in fact I still like it a lot. So I started experimenting within this field, trying all kinds of tools and approaches, also starting to try different materials like wood or coconut. 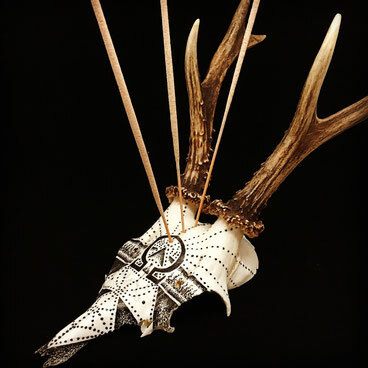 It’s a very open, creative art form, since there aren’t thousands of people doing it (yet), there are no rules, not many guidelines, not much help to find on the internet. The only way to do this is to find your own right way of doing it. C.S.R is simply a mix of my initials and a long time pseudonym which I’ve used since over 10 years. 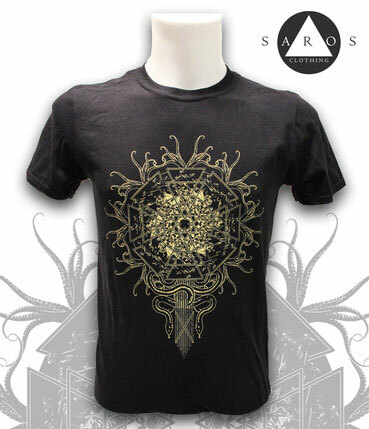 SAROS is the name of a series of sun/moon cycles, bringing eclipses on a steady pattern of 18 years. As a teen I remember choosing it mainly for the number 18, broken down to 6 + 6 + 6, nowadays it’s the solar & lunar eclipse idea which justifies to me still using it. Creating is an existential drive within me, something that needs to be happening in order to set free internal energies that would else cause damage in some ways. The only alternative way I can think of to keep the balance is a constant routine of meditation, which might be something to come back to in distant future, if or when the creation of art is no longer a possibility. In a more philosophical approach I’d say art is the voice of the spirit, a path to spiritual independence & freedom. As mentioned above, with no other alternatives I’d most likely end up in a depressive/self-destructive and very unbalanced, restless state. I’ve been in bands since the age of 16, so almost half of my life. I couldn’t really imagine a life without major artistic activities these days. Spiritual light & earthly darkness. That’s a tough question to me, since most things happen on a rather unconscious level when I’m working on something artistic. Things sometimes fall into order without me even noticing it until a later point. One principle I will always stick to is clearly that of honesty towards myself, overruling the weight of all scene-related or ideological sets of rules. Apart from that I would say that the prime guideline I follow is, again, the voice of the spirit, others might say “following the heart”. Pain & relief sums it up pretty accurately. Since I’ve already talked about my personal purpose behind creating, I’ll answer this question from the viewpoint of what message is aimed to be delivered to the outside – which would be that the expression of constant motion, exalted beauty & aesthetics throughout all levels, the dialog between earthliness & divinity.